Push the arms through the space between your thighs and calf muscles, you may need to spray some water on your arms if your legs are bare and the weather cooler (no sweat). If this is a problem see the notes below for garbha pindasana. 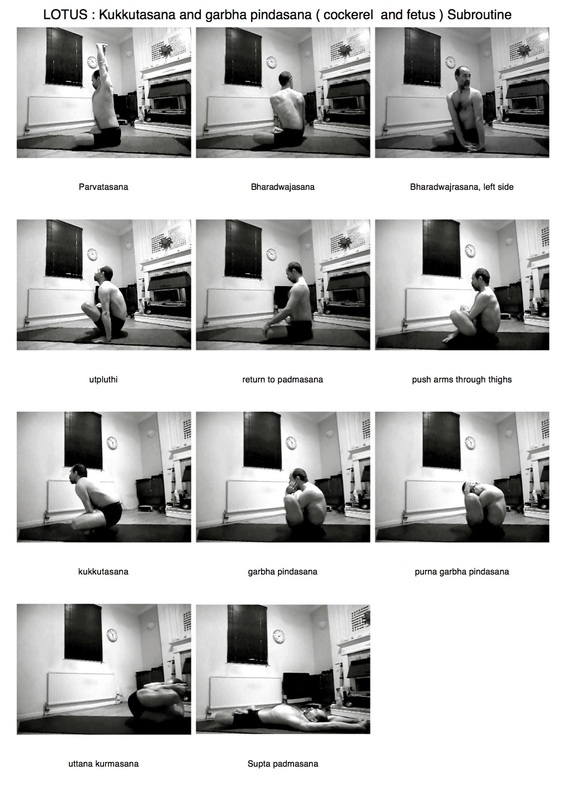 Exhale fully, hold, engage mula and uddiyana bandha and drop the shoulder blades down the back. Press down into the mat to lift but keep the shoulderbaldes lowered . As you press down visualise moving slightly forward and up. If you just push down there is a tendency to keep falling backwards off your hands. look at picture 7 and notice how there is a slight lean forward, the shoulders over the hands. Here, once in lotus, I lift my left leg a little away from the right holding just above the ankle. this creates a little more space to get the first arm through. For the second arm I press the top side of my left foot against my right thigh flexing the ankle a little to lever the leg up a little thus creating more of an opening to pass the arm through. Try taking the arms through at an angle, the right arm runs parallel to the right calf, same for the left. Utpluthi (Pic 4) is all about hand placement. place the hands too far forward and the weight of the hip bones will keep your grounded, too far back and the weight of the knees will stop you from achieving lift. So place the hands just forward of mid thigh as close to your thighs as possible. Mula bandha should be engaged but engage it more strongly, tuck the tailbone under, the lower half of your body should feel tight and compact, draw your pelvis up into your torso and hold. Keep the bandhas engaged and the tailbone tucked while your breath. In the earlier version of utpluthi you bend the body over the lotus, in a this version the body is more erect. Labels: garbha pindasana, Lotus subroutines, Subroutines.